Diode detectors for RF measurement . Diode rectifier circuits. Linearisation schemes. Diode data. Linear high-frequency AC Voltmeter and AM Detector. The complementary follower detector. A precision rectifier using 4 transistors. 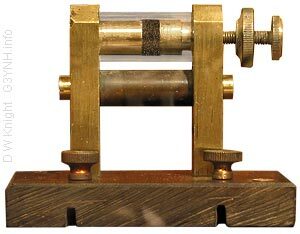 Hi-fi detector for AM Broadcast, By Robert Batey. High quality AM receivers using an updated version of the complementary follower detector. AM precision audio detector, by Patrick Turner (Turner Audio). Low distortion AM detector using the complementary follower principle. Ultrasonic receivers. Detectaids 900 series (1981, 1987). First application of the complementary follower detector . TBA120 Series FM Demodulator ICs. Ben Toungue. Crystal radio set design and other topics. This item is in the collection of the Porthcurno Telegraph Museum (a visit is highly recommended).